This was an error I’d seen before several times (as had Alberto – see here – and a few other people), and had previously associated it with memory issues and/or corrupted databases. However in this case I was confused because I was still able to query the SSAS Tabular instance in question from Excel and deploy to it from SQL Server Data Tools, so I was pretty sure there wasn’t anything wrong with the instance. Now the SSDT project associated with this workspace database had its Workspace Retention property set to ‘Unload from Memory’, so when I closed the project the workspace database disappeared from the server. 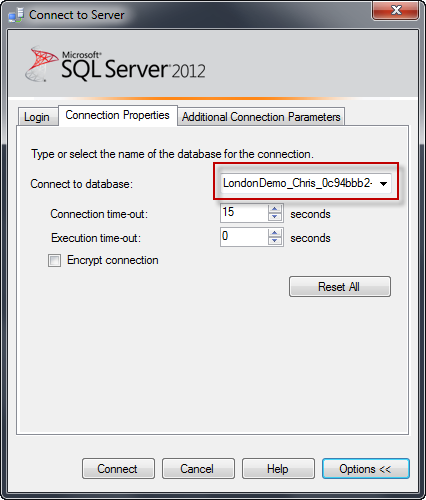 However in SQL Management Studio the Connection Properties dialog was still trying to connect to the database even though it was no longer there, and instead of giving a sensible error message it was giving me the “Unable to establish server mode” error. Fixing the problem was simple: I just went to the Connect to database dropdown and selected “<default>” instead of the name of the workspace database. I would imagine that a lot of people will run into this issue, not only when they have been connecting to workspace databases but also if they connect to regular databases that are subsequently deleted. Hopefully this blog post will save them a lot of time spent wondering what’s gone wrong! Red Gate SSAS Compare is a tool for Microsoft Business Intelligence professionals that generates XMLA scripts for partial or complete SSAS cube deployment. Easily deliver updates from development through test and production, minimizing the time spent processing and validating changes. It’s a very early release and therefore a bit buggy; in fact I haven’t been able to get it to work at all on my laptop (I suspect it doesn’t work with SSAS 2012). However I’m still very excited by the possibilities of this tool: quite a few of my customers have several versions of the same database, and need to find out how they differ and deploy the same changes to all of them. Definitely something to keep an eye on. Over the years I’ve written quite a few posts about Google’s BI capabilities. Google never seems to get mentioned much as a BI tools vendor but to me it’s clear that it’s doing a lot in this area and is consciously building up its capabilities; you only need to look at things like Fusion Tables (check out these recently-added features), Google Refine and of course Google Docs to see that it’s pursuing a self-service, information-worker-led vision of BI that’s very similar to the one that Microsoft is pursuing with PowerPivot and Data Explorer. 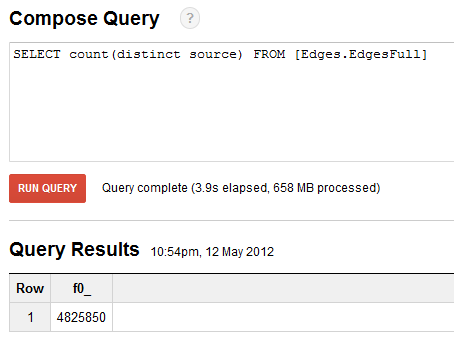 It’s actually described by Google themselves as an OLAP system here. I don’t agree with this classification – I think it’s better to describe it as an analytical database – but it was enough to make an old OLAP-fan like me curious. It’s also a column-store database. While it’s hardly a complete BI solution in itself it could easily be used as the back-end for one and I believe the French BI vendor BIME already support it as a data source. 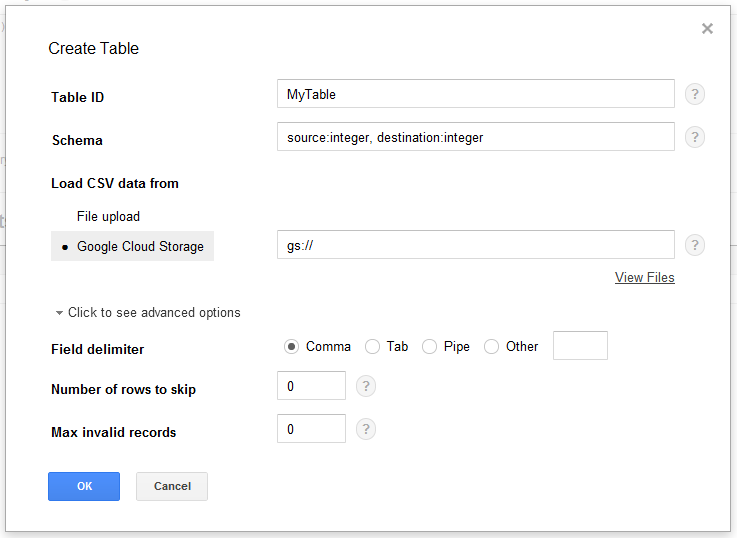 I’ve argued in the past the only reason that anyone would want to do cloud-based BI would be to scale way beyond whatever on premises hardware they could afford, and Google does make some impressive claims for its scalability: it should be able to provide quick response times for queries on terabytes of data. After all, if I can handle hundreds of millions of rows of data in PowerPivot on my laptop then I’m only going to be tempted to use a cloud-based solution if I need to work with much larger data volumes. It’s based on Dremel, and I’ve heard that one of the developers that works on Dremel is someone we used to know well in the world of Microsoft BI. 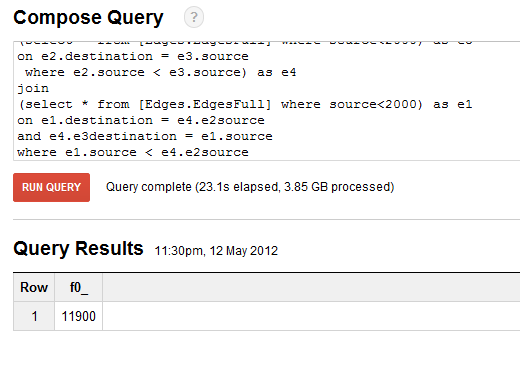 While not astounding fast it, the fact that all these queries executed in under 5 seconds means that performance is good enough for ad hoc data analysis. Ignoring the my-technology-is-better-than-yours tone of this post, I thought this was an interesting problem: easy to understand but difficult to calculate quickly, and a good test for any product with pretensions to being a ‘big data’ platform. 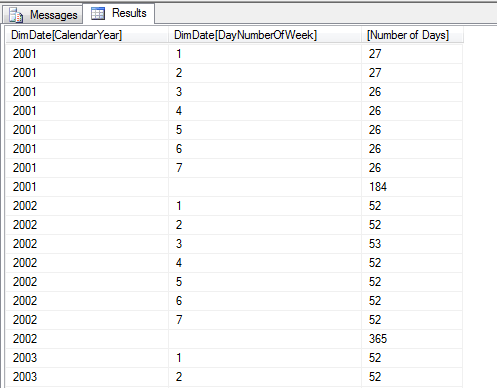 The two columns in the csv file are meant to represent the ids of members of a social network, and with each row representing a relationship between two people. 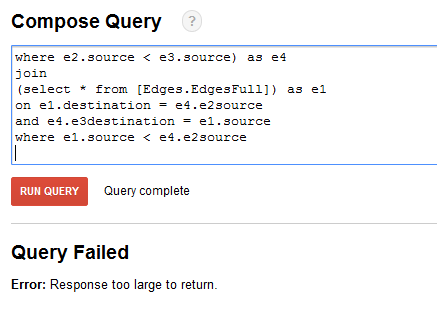 The problem to solve is to find how many ‘triangles’ there are in the data, ie situations where person A has a relationship with person B, person B has a relationship with person C and person C also has a relationship with person A.
BigQuery provides real-time query performance for JOIN statements where one of the two sides is small. Here small means less than 8MB of compressed data; compression rates vary, but are usually in the range of 2-10X as compared to the corresponding CSV. We expect this 8MB limit to continue to increase over time. For simplicity, we always require the table on the right side of any JOIN clause to be small. Outer joins with a small table on the "outer" side are unsupported, which means that we only support left outer joins. A bit disappointing, but maybe this is a problem more suited to Pregel than Dremel? Certainly in more traditional OLAP scenarios when you need to join a fact table to a dimension table, many dimension tables will be smaller than 8MB when compressed so this limitation wouldn’t be such an issue. 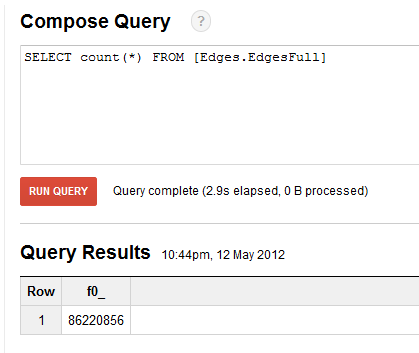 Overall I was impressed with the performance and ease-of-use of BigQuery, and I’ll be interested to see how it develops in the future and integrates with the rest of the Google stack (it’s already possible to hook it up to Google docs with a bit of coding). I will, of course, be equally interested to see what Microsoft’s cloud BI and Office strategy comes up with to counter this. Thanks also to Jeffrey Wang for the background on this. Today I’m teaching the SSAS 2012 Tabular workshop with Alberto Ferrari in Belgium, and an interesting question came up during my session on DAX queries to do with subtotals that I couldn’t answer immediately. However, I found a solution fairly quickly afterwards and so I thought it was worth blogging about – especially since I think it’s a better solution than the one that Alberto knew about already! 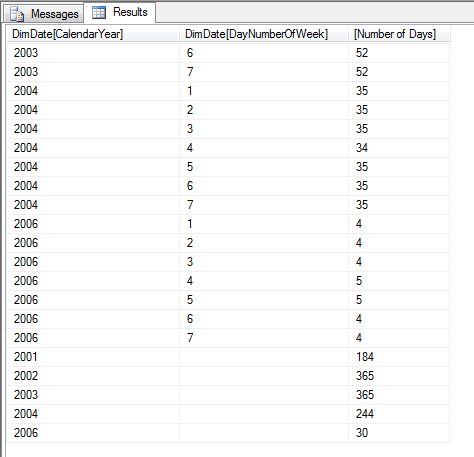 It returns the number of Days in the table by calendar year and day number of week – it’s very similar to a basic GROUP BY query in SQL. I blogged about this use of Summarize() and Rollup() last year here. I’m using the GenerateAll() function to take the list of distinct years returned by the Values() function and then, for each year, return a table of day numbers with a subtotal and crossjoin the result. This gives us our subtotals in the correct position without any sorting required. 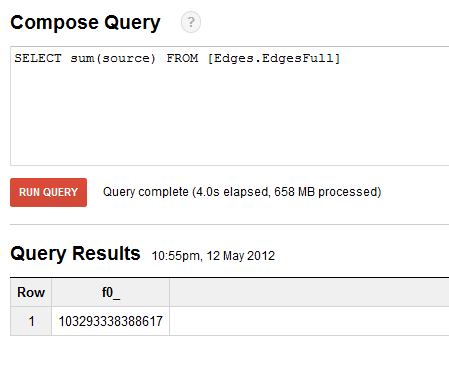 I had to wrap my original countrows() with calculate to make sure it returned the correct value. We’ve listened to feedback, trimmed some of the costs and content, and reduced the price to €4500 (€3500 for attendees of previous Maestros courses). We’re going to be joined by Thomas Kejser for some of the course, who’ll be sharing his experience of working on some of the largest cubes in the world. So, to sum up, this is the ultimate in SSAS training and if you want to take your SSAS knowledge to the next level you should come along. 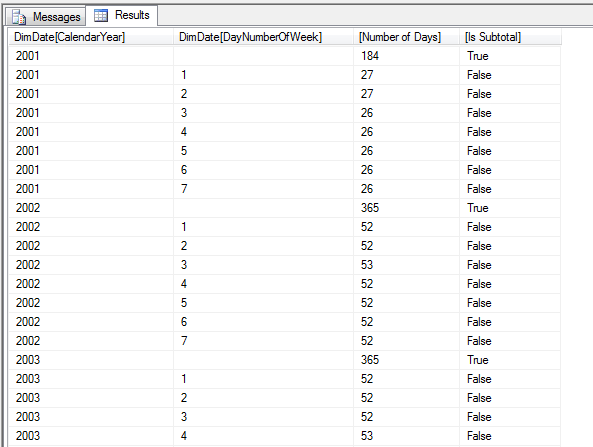 One of the few new features in SSAS 2012 Multidimensional is the ability to use Extended Events (XEvents) for monitoring purposes. I was, naturally, curious about how to use them but quickly found that the documentation in Books Online was completely useless – the code example given just doesn’t work. This started a number of discussions with people like Akshai Mirchandani, Nick Medveditskov, Rob Kerr, Greg Galloway, Francesco De Chirico who all helped me get to the point where I had something working, and I’m very grateful to them. This is a short summary of what I’ve learned so far; hopefully some working XMLA samples will be useful to anyone else who is researching this subject. <event_session name="xeas" dispatchLatency="1" maxEventSize="4" maxMemory="4"
The important parts are the list of events, which are the same as the events that can be seen in Profiler (for a full list see here), and the target node which specifies the .xel file to output to. 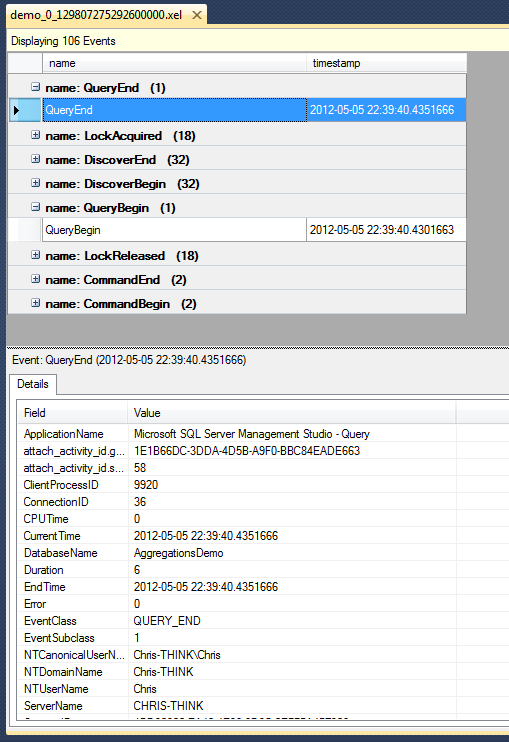 There are three traces shown running here on my SSAS instance and the last in the list is the XEvent trace I’ve just created.